Africa loses an average of three rhinos a day to the ongoing poaching crisis and the illegal rhino horn trade. In 2016 alone, 1,054 rhinos were reported killed in South Africa, representing a loss in rhinos of approximately six percent. 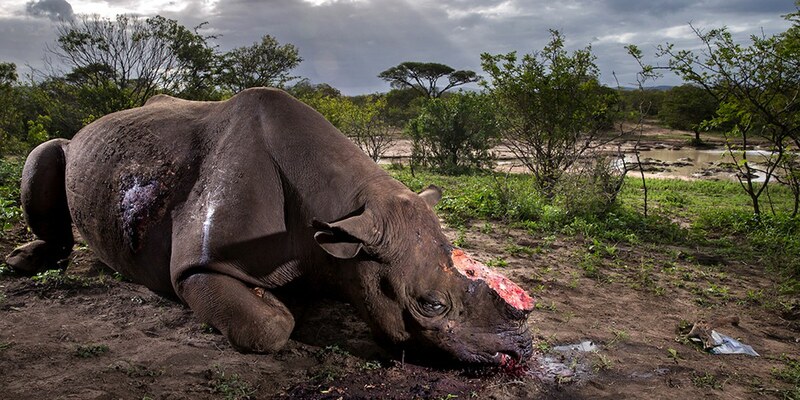 That’s close to the birth rate, meaning the population remains perilously close to the tipping point.This year, the Natural History Museum in London awarded photographer Brent Stirton the 2017 Wildlife Photographer of the Year grand title for his grisly image of a black rhino with its two horns hacked off in South Africa’s Hluhluwe-Imfolozi Park.”Brent’s image highlights the urgent need for humanity to protect our planet and the species we share it with,” said Natural History Museum director Sir Michael Dixon. One of the most disturbing photos, ever. I’m glad it won and for the reasons it won.